Nobel Peace Prize: Does an Australian-born anti-nuke group’s award achieve anything? ABC News By Europe correspondent James Glenday , 9 Dec 17 It has been dubbed an “ambassador boycott”, a Nobel Peace Prize ceremony snub. When an Australian-born movement to ban nuclear weapons receives the world’s most prestigious award this weekend, Russia will be the only declared nuclear power with a top diplomat present. Israel is sending an ambassador, though it does not confirm or deny it has nuclear warheads, while the US, the UK and France have chosen to make a statement — they will only be represented by deputies. The prize winner, the International Campaign to Abolish Nuclear Weapons (ICAN), claims the “ambassador boycott” by western countries is aimed at undermining its work. It has fought for a global treaty banning nuclear weapons, which now has 53 signatories. But the document remains somewhat symbolic because no nuclear powers have signed it and neither have many of their close allies. Australia, for example, has long argued banning the bomb outright — while emotionally appealing — will not lead to any meaningful reduction in nuclear weapons and may divert attention from existing treaties aimed at preventing nuclear proliferation. Thus far, the Turnbull Government has stopped short of congratulating ICAN, which began in Melbourne…….. There has been controversy and contradictions surrounding the Nobel Peace Prize ever since it was founded by Alfred Nobel, a Swedish businessman who invented dynamite and traded arms…….. This year the award is worth 9 million Swedish kronor, more than $AU1.411 million. “That money helps a young NGO [like ICAN], one that doesn’t have much access to funds, one that is perhaps being denied funds because of some political problems,” Dr Lewis said. “ICAN was founded in Australia. It’s something that Australians have achieved.”……..
ICAN is, of course, hoping the prize will convince more people to back its bomb ban. But it also wants more public debate about the pace of nuclear disarmament — many nuclear experts agree things have moved too slowly, for too long. “I would hope [ICAN’s work] generates some momentum within existing processes for disarmament,” Mr Dall said. Regardless, the prize, the controversy and “ambassador boycott” is all invaluable for ICAN itself. Cancer cluster fears after more than 20 deaths https://www.tweeddailynews.com.au/news/cancer-cluster-scare-black-sand-suspect-in-deaths/2748511/ by Alina Rylko 22nd Aug 2015 Updated: 14th Aug 2017 A MULTI-GENERATIONAL tragedy costing dozens of lives on a short stretch of road in the Tweed Valley is claimed to be evidence of a cancer cluster. A Tweed Heads GP believes a high rate of brain, bone, blood and eye cancers – killing sufferers as young as teens, and still affecting people today, could have been caused by widespread use of radioactive sand as soil fill. He claims to be aware of 28 cancer cases on one Mooball street – treating four of those as patients. Twenty-one of those cases have been verified by the Tweed Daily News through the sufferers’ family members. The fill thought to be responsible came from the tailings produced at a 24-hour sand mining processing plant once located near Mooball-Pottsville Rd. Intense sandmining of the Tweed was undertaken from 1935 to 1977 and government records show that from 1942 to 1952 the plant processed 29,200 tonnes of rutile and zircon, dumping 200 tonnes of radioactive monazite as tailings. Residents have told the Tweed Daily News it was “common knowledge” tailings were used in sandpits, garden beds, house foundations, creek fills and in a drain running past the backyards of cancer sufferers. Historically, it’s said the Tweed Shire Council attempted to remove ‘black sand’. And the NSW Health Commissioner surveyed Mooball for radiation, giving it the all-clear. However Dr Paul Malouf – a resident of the village for more than 43 years – believes more detailed testing should be done. “When the council went in to remove it, of course they didn’t get all of it,” he said. “I was very concerned when we sat down and put on paper the number of people who had contracted cancer in this small village,” he said. In response, the district said monitoring of mineral sand radiation was “limited” to Mooball’s council park, where the plant was located. Its most recent survey in 2010 showed “elevated radiation levels” at the park, but they were “safe” because the park did not have “regular occupancy by the same individual”. Dr Malouf was alarmed that properties on Tweed Valley Way, where he claims the cancer cluster is, had not been tested. However some residents, including those touched by cancer, are not concerned about cancer cluster and radiation claims. They include Leo Kelly. The Mooball resident of more than 70 years said, although unclear about the exact year, the NSW Government ordered the extraction of black sands in Mooball.\ This included under his home and under the railway. It was replaced with “good fillings”, Mr Kelly said. 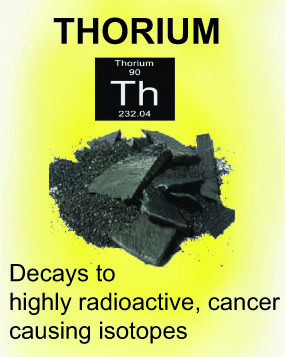 The Tweed Daily News believes by then monazite’s thorium content was realised and it was valuable as nuclear fuel. “It was so rich – 80 to 90% richer than in the (beach) terrace, they turned around and paid us for it,” Mr Kelly said. Kenneth Kingsford said he was hired about 1982 by the then-Health Commission to identify tailings from the Queensland border to Taree, over a five-month period with a Geiger counter. Mr Kingsford established where tailings were in Mooball, based on word-of-mouth. “It was quite obvious where it was; the people would tell us,” he said. Confident he tested where all the tailings were, he said “none” was found at a “concerning” radioactive level in Mooball. While Mr Kingsford was obligated to survey every home in Byron Bay, he was not obligated to do the same in Mooball. Current Tweed Shire councillor Phil Youngblutt said no one could rule out that black sand remained.”You’d have to test every yard for it,” he has previously told the Tweed Daily News. The council’s regulation manager Vince Connell said, ultimately, radiation concerns needed to go to the Environmental Protection Agency. “The proper course of action would be for the local medical specialist to raise those concerns with NSW Health,” he said. Australian and Chinese banks have turned it down, and analysts say Adani’s failure to secure funding for the Carmichael mine leaves it high and dry, Guardian, Michael Slezak, 7 Dec 17 , Adani’s operations in Australia appear to be hanging on by a thread, as activists prove effective at undermining the company’s chances of getting the finance it needs. UK government study finds electricity would be nearly one-third pricier than it would from plants such as Hinkley Point C, Guardian, Adam Vaughan, 7 Dec 17, Electricity from the first mini nuclear power stations in Britain would be likely to be more expensive than from large atomic plants such as Hinkley Point C, according to a government study. The analysis by the consultancy Atkins for the Department for Business, Energyand Industrial Strategy said there was “a great deal of uncertainty with regards to the economics” of the smaller reactors. green groups and politicians accused the government of talking down renewables. Turnbull government drops plans to curb green groups but doubts remain, The Age, 6 Dec 17 Peter Hannam Environment groups have welcomed the Turnbull government’s retreat from plans to curb environmental advocacy but concerns remain about other proposals to restrict the charity sector. Kelly O’Dwyer, Minister for Revenue and Financial Services, announced the government would drop its intention to require environmental charities spend at least 50 per cent of donation income on “environmental remediation work” to retain their tax-deductible status. “The government will not mandate a level of remediation by environmental organisations,” Ms O’Dwyer said. The push for a required level of environmental work lost traction after BHP indicated it would oppose such curbs. The Australian Conservation Foundation welcomed the backdown of the government’s “anti-democratic proposal” to curb environmental advocacy. “Advocacy makes Australia a better place,” Kelly O’Shanassy, ACF’s chief executive, said. “It has kept oil rigs off the Great Barrier Reef, and given us Landcare, clean energy, air and water, and a Franklin River that flows.” “It is interesting this backdown follows a statement by BHP opposing the changes, and even a retreat by the Minerals Council in recent weeks,” she said. The Minerals Council of Australia had sought as much as a 90 per cent requirement for remediation efforts, with only 10 per cent for advocacy for green groups to retain their tax-deductibility status. But other moves by the Turnbull government are fanning uncertainty, including plans released on Tuesday to ban foreign donations to advocacy groups. Samantha Hepburn, a law professor at Deakin University, said financial reporting requirements under the Annual Information Statement (AIS) collected by the Australian Charities and Not-for-profits Commission could pose other challenges for environmental groups. Where an environmental group provided an AIS that revealed strong expenditure on political advocacy rather than remediation, it might be investigated by the Australian Taxation Office. The proposed changes increased funding for the ACNC and the ATO to review more groups for their ongoing eligibility for tax benefits, she said. Michael Flynn’s involvement in a plan to build nuclear reactors in the Middle East is looking even shadier https://www.vox.com/2017/12/6/16743476/michael-flynn-russia-sanctions According to a whistleblower, a Flynn business associate bragged that Flynn would end sanctions on Russia to clear the way for this project. By Andrew Prokopandrew@vox.com Dec 6, 2017 On President Donald Trump’s Inauguration Day, a former business parter of incoming National Security Adviser Michael Flynn allegedly bragged that Flynn told him Trump would quickly lift US sanctions on Russia — a move that would pave the way for a controversial plan to build nuclear plants across the Middle East, with Russian help. Greens MPs arrested and fined at Adani protest, as Indian miner is referred to consumer watchdog, The New Daily 6 Nov 17, Two NSW Greens MPs have been arrested and fined for protesting against the proposed Adani Carmichael coalmine, while another front was opened in the long-running battle against the development. Jeremy Buckingham and Dawn Walker were among 17 people arrested on Wednesday morning for trespassing at the controversial site, 270 kilometres west of Bowen in Queensland. Mr Buckingham and Ms Walker were fined $250 each after being issued with a police infringement notice for trespassing unlawfully at a place of business. “I’m proud to stand with activists in defence of climate and country, and respect all those people around Australia and internationally who want to stop the Adani coal project,” Mr Buckingham said in a statement on Wednesday. Ms Walker said the proposal was “tearing Indigenous communities apart” and was offering “a sub standard agreement to traditional owners for their land”. About 5am on Wednesday, Queensland Police were alerted that 35 people were blockading the railway construction site near the proposed mine. Fourteen protesters entered the site and climbed onto vehicles and machinery about 6am, a police spokesman told The New Daily. A woman in her 60s locked herself to a boundary gate with a metal bike lock around her neck. Police were working to remove her. Seventeen people were arrested for trespass and failure to comply with direction. Nine of those people were issued with infringement notices after moving on. Will the interruption of match in New Delhi between India and Sri Lanka by toxic smog finally spur the Indian Government to take coal plant pollution seriously? Archer Exploration has been granted approval for its Campoona graphite project, north of Cleve on the Eyre Peninsula. Zen Energy gets electricity retailer licence to offer “baseload renewable energy” product and proceed with 1GW solar and storage facility at the Whyalla Steelworks. ANU’s Andrew Blakers says switching Australia to 100% solar, wind, pumped hydro energy storage would cut water use by a factor of four. It’s hard to predict the exact effects of climate change over the course of a few decades. Even while broad trends appear, the litany complex interactions between the air, the water, polar ice, land masses, and so on, make exact predictions elusive. To deal with this problem, scientists develop models that simulate a few of these elements at one time and see which models are the most accurate. This variety of climate models is the reason long-term predictions tend to be all over the place, with some models predicting only a few degrees of warming while other models predict a lot more. While some people have been pointing to the more milder predictions as evidence that climate change might not be that bad, there is some bad news. A team of researchers from the Carnegie Institution for Science has found that the most accurate models so far also tend to be the most severe ones. The new study, published in Nature, compared more than a decade’s worth of data from climate satellites to a wide range of different climate models. This data included the amount of sunlight reflected back into space, how much heat is leaving the Earth, and how much total energy is entering and leaving the atmosphere. Scientists then analyzed various climate models for that period to see which ones came closest to predicting reality. The researchers found that the most accurate models were the ones that predicted the most warming over the next century. This means that rather than see only a few degrees of warming—as predicted by some of the milder models—we’re much more likely to see almost twice that. The Northern Australia Infrastructure Facility will keep assessing a potential $1 billion loan to Adani until it is officially killed off by the Queensland government. https://www.brisbanetimes.com.au/national/queensland/accc-asked-to-investigate-adani-jobs-claim-20171206-p4yxfl.html Environmental lawyers have asked Australia’s consumer watchdog to investigate Adani’s claims that its controversial Queensland coal mine will create a jobs bonanza. Environmental Justice Australia this week wrote to the Australian Competition and Consumer Commission asking it to investigate what it says is “misleading or deceptive conduct” by the company relating to the Carmichael mine in the Galilee Basin. “Plenty of evidence suggests Adani’s representations about 10,000 direct and indirect jobs are seriously flawed, yet the company continues to mislead people looking for work,” said EJA lawyer David Barnden, who said the Queensland Land Court had already ruled the mine would create just 1464 jobs. The future of the mine has suffered setbacks this week, with project funding from China looking increasingly unlikely. The Bank of China on Tuesday issued a one-line press release saying it “has not, and does not intend to, provide funding for the Adani Carmichael Mine project”. It is the third of the country’s “big four” banks to distance itself from the mine, following The Industrial & Commercial Bank of China and China Construction Bank’s decision not to stump up cash. Australia’s own big four banks have already ruled out supporting the project. The Greens say it signals the end of the mine. The protest comes after community legal service Environmental Justice Australia (EJA) referred the Indian miner to the Australian Consumer and Competition Commission (ACCC) over its jobs spruiking. Acting for Townsville jobseeker Chris McCoomb, a volunteer coordinator with the Australian Unemployed Workers Union, EJA is urging the ACCC to investigate Adani for “misleading vulnerable jobseekers”. EJA says “inflated” claims its mine will create 10,000 jobs is leading jobseekers to spend thousands of dollars on training for “jobs that will never exist”. Mr McCoomb’s 17-page complaint names at least one Queensland mining training outfit that is using Adani’s “inflated figures … to promote sometimes costly training courses and certifications” to cash-strapped jobseekers. That company advertises a one day “mining induction course” for $650. In 2015, Land Court of Queensland president Carmel MacDonald found Adani had significantly “overstated” its job figures in court evidence and to the State Government. Ms MacDonald accepted testimony the project would “increase average annual employment by 1,206 jobs in Queensland and 1,464 jobs in Australia”, not by 10,000. EJA lawyer David Barnden told the ACCC “the evidence for misleading and deceptive conduct … is strong”. “ACCC is urged to take action to prevent the continued dissemination of Adani’s misleading or deceptive statements that are directed at jobseekers.